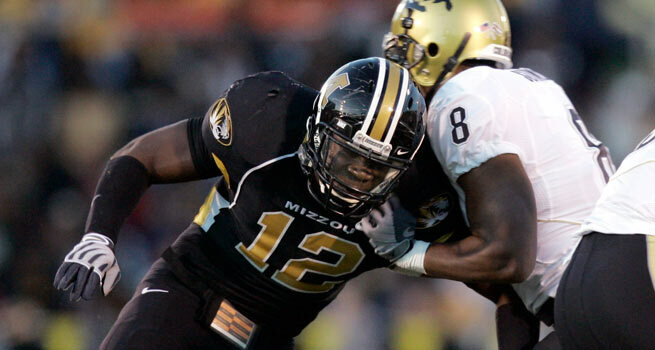 Published: Aug. 12, 2009 at 08:50 p.m.
Missouri's Sean Weatherspoon has the athletic ability and versatility to play for a long time in the NFL. It is always important for outside linebackers to be able to use their hands to jam receivers they may be forced to cover. Over the past 10 drafts, 25 outside linebackers have been selected in the first round and 26 in the Round 2. The 2010 draft looks like it will have some good players. Here is a fun fact: Thomas 'Hollywood' Henderson, who was drafted in the first round of the 1975 draft and received a $40,000 signing bonus, won the lottery in the state of Texas twice and earned over $25 million in doing so. Kindle played as a true freshman in 2006 and 2008 was his first year as a starter. He was a high school running back, who rushed for 5,632 yards in three years and started on the basketball team. He made the Texas high school All-State team on both offense and defense (first-team on both). His best position in the NFL might be as a hand-on-the-ground pass rusher, who has the strength, quickness and toughness needed to be taken in the lower-half of the first round. Weatherspoon played as a true freshman in 2006 and has started 28 games over the past two years. He had 155 total tackles in 2008, plus five sacks and returned two interceptions for touchdowns. He plays weakside backer and is an aggressive player with speed, who is a good blitzer and a good player in space. Weatherspoon can play every down and should play a lot of years in the NFL. He was a high jumper and point guard in high school. Muckelroy is a fifth-year player, who started 16 consecutive games and had 50 more tackles (112) in 2008 than Texas' next-highest tackler. He has very good speed and athletic ability and can play in space, is good vs. the run and should be a solid starter and special teams player for many years. Norwood played as a true freshman and had six sacks. He played defensive end his first two years at South Carolina and played linebacker in 2008. He had nine sacks, made first-team All-SEC at defensive end in 2008 and linebacker in 2008. Norwood has started 25 consecutive games and has great versatility as a player, can rush the passer or play coverage, plays hard every play and is a good character person. I wish her were a little taller, but he should be a good player for years and is a Pittsburgh-type player and good athlete. Cole is a fifth-year player, who played defensive end his first two years at San Jose State. He has started 31 games and had 68 tackles and 3.5 sacks in 2008. He was selected second-team All-WAC in 2008 and was a sprinter in high school, who has the ability needed to play in the NFL. He is a very good competitor with size and speed and can play with his hand on the ground or in space. Sapp is a four-year player, who tore his ACL in the 10th game of the 2008 season. He has played defensive end for three years and was a great high school athlete as a track sprinter and starter on the basketball team. He has pass rush ability coming off the edge, because of his speed and quickness. The question will be if he can play in space and recover from his injury. He has the physical talent. Watson played as a true freshman, starting one game as a strong-side linebacker. He had 46 tackles in 16 games in 2008 and is very athletic and can play in space. Watson is a big hitter at the college level, but needs to get bigger to play well in the NFL. He will be a good special teams player. Lee is a fifth-year player, who played as a true freshman missing the 2008 season with a torn anterior cruciate ligament in his right knee. The injury happened during spring practice in a non-contact drill. Lee won All-State awards in both football and basketball before the injury. He was outstanding and a great competitor, with quickness. He is a very instinctive player with speed and is a smart player, leader and co-captain for the 2009 season. If healthy, he is a starter in the NFL. Sheffield is a four-year player and two-year starter at defensive end. This is a playmaker on defense and was a first-team all-conference player in 2008. He plays faster than his timed speed (4.80) and is very athletic with very good quickness and is strong, tough and can play in space. Troy has turned out some good players over the past several years, including DeMarcus Ware and Osi Umenyiora. Washington played as a true freshman, who has started just two games in his first three years. He has the speed (4.58 40) to play safety, but is not big enough for linebacker. He will be a great special teams player for an NFL team. He has ability, but needs weight and strength. The 2009 season will be a big year for him. Washington is well coached and had 63 tackles, two sacks and one interception in 2008. Sharpton is a fifth-year player, who played sas a true freshman. He was injured in the third game and received a medical hardship (leading to an extra year of eligibility). He has started 20 games the past three years and earned a degree in finance (May '09). Sharpton had 66 tackles and 1.5 sacks in 2008 and is a very good player that lacks ideal size. He is a very good special teams player and has strength, quickness and has played middle linebacker. Lawrence played two years at junior college before coming to Minnesota in 2008. He was a high school running back of note. He started five games in 2008 and had 66 tackles, four sacks and one interception. Lawrence is a great athlete, who seems to have excellent coverage skills and runs well. He needs to add weight, but he is a young player who will be 21 in 2010. Lee is a four-year player, who will open some eyes. He plays inside linebacker and makes tackles all over the place. He can also drop into space and make interceptions (five for his career). Lee was a first-team all-conference player in 2008, ran a 4.7 40 in the spring and is strong, touch and quick. He should be a great special teams player. Rolle is a four-year player, who has started 35 games at safety for the Seminoles. He was named the high school player of the year in 2005. He needs to switch to linebacker in the NFL and is very smart -- one of 32 students in America to be named a Rhodes Scholar. He needs to add weight, but is a very good competitor, with the athletic ability, quickness and strength needed for the position. Edds is a fourth-year player, who came to Iowa as a tight end and moved to linebacker in 2006. He is a very good athlete, with size and speed for the position. He ran a 4.68 in the spring and was an honorable mention All-Big Ten in 2008. he will take on blockers and make plays vs. the run. He can play in space and is a very good competitor. McCoy is a fifth-year player, who has started 27 games over the past three years. He was named second-team All-SEC in 2008 and was the second-leading tackler on the team in 2008. McCoy makes a lot of plays and is a very good special teams player -- strong with good speed. He lacks ideal height for the position. Ihenacho played and started three games in 2006 as a true freshman and played injured in 2008. He has the ability to rush the passer and was a tight end in high school, who can play in space. Conner is a fifth-year player, who led the team in tackles in 2008. He is an athletic player, who was a high school running back. He is smart, strong and a good competitor, who moves well. He has good speed and will be a good special teams player.